Welcome to Japan, land of the Rising Sun, temples and Godzilla. It is in this beautiful land that we are taken by comedian Tom Green and the MTV camera crew. Be warned. As with much of the Tom Green series, it is not for the weak of stomach. 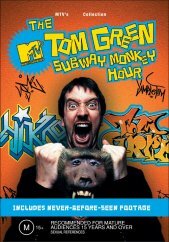 For those of you not familiar with The Tom Green Show or any of his MTV specials, the humour is puerile, and often totally irreverent. Green intends to shock and manages to do so at every turn. This style of presentation is not for everyone, however as always. I found myself laughing so hard that it hurt. One of the first things you will notice is that this is situational comedy taken to an extreme, and most often involves taking an ordinary occurrence and then blowing it all out of proportion. It's always hard to describe a Tom Green show in sufficient detail to make another person laugh as most of the time it just sounds stupid. One that stands out to me is when at a sacred shrine, a man slips down fine stairs and Tom starts laughing at him. Through a megaphone and pointing no less. Another hilarious moment is when he enters a restaurant and whilst telling us about the Japanese tradition of slurping their soup and noodles, he gets his own bowl and makes an absolute mockery of it. I realise that in text that sounds pretty lame, however to watch it will make you laugh. The buffoonery just keeps on coming as Green takes advantage of the fact that the Japanese are a very polite people and comes up with ways to exploit it. I think part of the reason that it is as funny as it is, is that no matter what he does, the Japanese people, to their credit, take it in their stride and are far too polite to acknowledge what a dimwit he is being. 'The nice thing about this disc is that there a number of extras on it for you to enjoy after the main feature, one of which entitled Culture Club, really should have been included as part of the main feature and is fall down laughing funny! As usual most of this stuff is done on the street and the visuals and audio do suffer a little bit. But when it's Tom Green, who cares! Get it!